At one time or another, we all have needed to light the candles and take a relaxing bath. Whether to recover from a hard day at work, or a hectic day of children demanding our attention, sooner or later it happens. 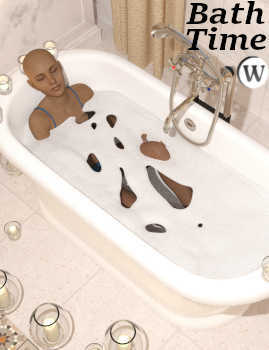 Pose 01 Relaxing Bath was designed just for that purpose to complete your STZ Bathroom scene with the Genesis 8 Female relaxing in a comfortable and bubbly tub full of warm water. Click here for the STZ Bathroom.